Lunarfurniture.com – A comfort bed as a place to take a rest is one of everyone’s dreams. There are a lot of people who still cannot enjoy the comfort bed as the place for them to sleep. We can see people who sleep on a kind of mat or carpet. Well, bed can be made of several materials, such as kapok, foam, or even air. 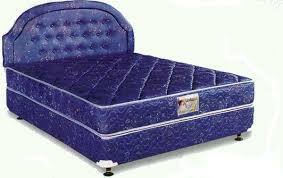 Commonly, the quality of the bed will going down due to the utilization time. We can feel it by the uncomfortable feeling of the bed when we lie on it. Well, we don’t have to be hurry in searching for a new bed which mostly in expensive price nowadays. There are some tricks that we can do if we want to make our old bed comfort to be used anymore just like a new bed. The most problem of the old bed is the downing area in the center part of the bed. The center area of the bed is the most point that used by people to sleep, that’s why this area is the first area which downed due the time. In order to handle this problem, we can use a simple trick by putting the bed linen folded part on it. The folded part of the bed linen can make the surface of the bed even anymore. If you want to prevent your new bed from this problem, you can turn the bed position round frequently. Some bed is colored white so that it will be faint due the time. We can change the pillow frequently to fix it, but we also can do some tricks such as by dry washing the old and dull pillow. The pillow is placed inside the dryer of the washing machine with some softener and two ball tennis. Mix them all in the dryer for 10 minutes and you will find a great result from the pillow. You also need to change the bed linen in order to keep the bed appearance fresh and new. You also can change the bed headboard by yourself. The materials needed for this bed part are only triplex, foam, and cloths. The new headboard can help the appearance of the bed.